Today’s blog post is all about launching an epic online course. This story is about the launch of the online course we have been working on while we juggled other aspects of our online business: Storyboard Your Way to E-Course Success. So, as you may gather from the course title, we started out systematically when developing this training and created a storyboard or blueprint of the content first. This involved planning out not just the content but the instructional design as well the narration script/notes and media. This is most definitely the way I recommend you approach online course creation as it allows you to avoid having to re-record audio or video if you want to change something. This is all explained and taught during our course. 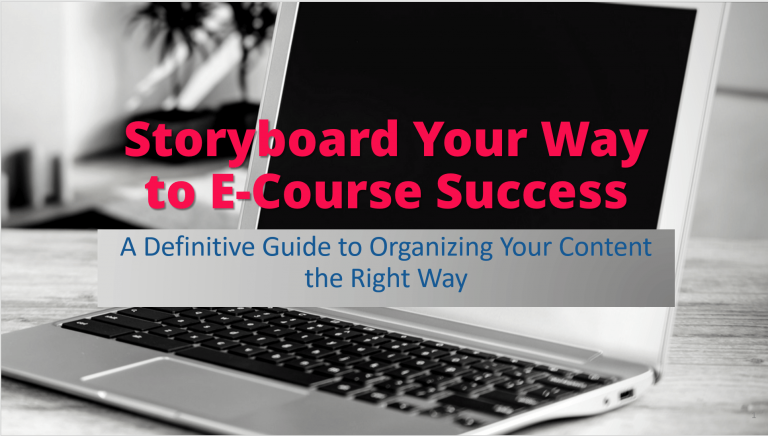 So if you want to create a fail-proof system for course creation, I encourage you try our free trial of Storyboard Your Way to E-Course Success, where you’ll get the first two lessons for free. Anyhow, I digress slightly from what I was about to tell you. We will look at the launch of this epic online course from the point where our storyboard was completed in PowerPoint to where we uploaded all our files and created our assessments in Thinkific – our course platform of choice. So, now we are ready! We have our storyboard complete so let’s get set and go - launching an epic online course! 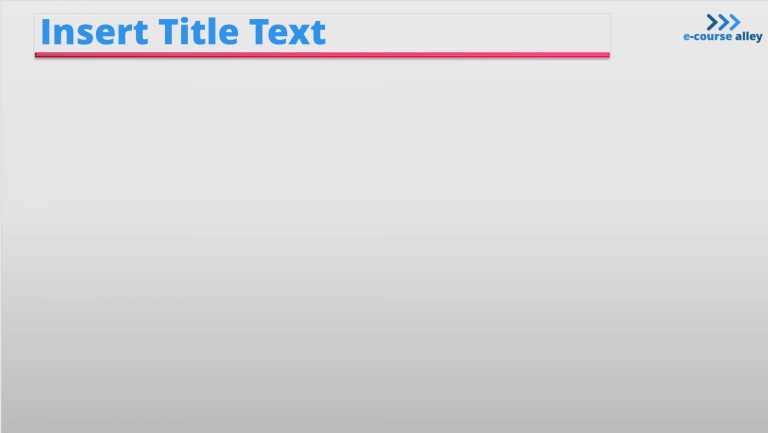 Step 1: Once our storyboard was complete and in PowerPoint, we renamed the file with “_Course” to distinguish it from the storyboard file and so that we could now upgrade it to the course slide design. Note, that we had planned to use PowerPoint for our course slides, so this made transferring over from the storyboard much easier, since we storyboarded using this program as well. Step 3: Next, we modified the Master Slide which converted our slides from storyboard format to course format and updated our fonts. Step 4: Then we had to edit out any leftover storyboard components, such as instructions, move some components around to fill in the slide, etc. We also had to satisfy any instructions that we wrote ourselves on what media to include and how to create it. Steps 1-4 took only about 3 days to complete since we had already done most of the hard work at the storyboard phase of course production. So, we were pretty happy being able to convert over our storyboard slides so efficiently! You can view some Behind the Scenes videos for launching an epic online course on our YouTube Channel showing the key steps in this process. Don’t forget to subscribe for updates and more tips, tricks and behind the scenes footage if you are interested in course creation and want to give it a try. Our behind the scenes footage is also uploaded onto our website at the ECA Academy. Come Follow the Alleyway to Better E-Courses! 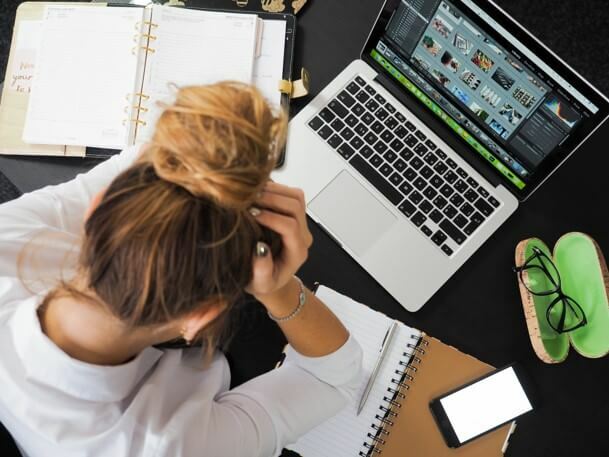 One thing you may discover as you put together an online course, even if it is a mini-course is that you will be juggling many things at once as you are doing it. For example, if you start out by pre-selling your online course, you will be doing some marketing alongside your content creation. If you have a website, you have to maintain this as well, so you will be juggling blog content creation at the same time. Let’s say this is your side hustle at the moment, then you’d also be juggling a day job, not to mention personal responsibilities like family, friends, and general day-to-day life activities. This can be overwhelming - and we definitely experienced this while launching an epic online course! Despite experiencing the overwhelming feeling of juggling too many balls in the air, so to speak, we were able to overcome this feeling by setting aside in our mind all the other things, while we were working on one of them. Let me explain that a bit more. So, when we were creating content for our course, this is all we focused on and when we were updating our website with more blog content, this is all we focused on for the moment. Other struggles we had included computer issues: my computer of almost 10 years old started to have some problems. Not. Good. Timing! So, I had to get a new computer as soon as possible. Luckily our Chief Technical Officer was able to build a new high-performance desktop machine for me and I’m also finally upgraded to Windows 10! Yes. I know, I’m a bit behind on that one! Another obstacle was encountered with PowerPoint and my single-monitor set-up. If you only have one monitor, PowerPoint won’t allow you to see your narration script while you are recording. 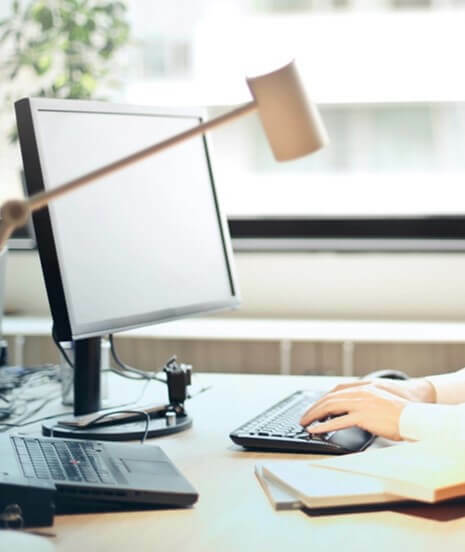 Now, if you have a dual monitor set-up, this won’t be an issue as PowerPoint can display the Presenter View on one monitor and record the presentation slides on the other monitor. However, with only one monitor, as our current set-up, and after extensive research, we discovered that it really isn’t possible to view your notes while recording in real-time. There are apps out there, such as Duet, to extend your monitor to an iPad, for example, but from experience we didn’t find this was very reliable and computer crashes happened frequently. I therefore resorted to using an iPad to display our notes in front of me while recording. I accomplished this by exporting the PowerPoint file as a pdf and selecting the option to show the notes section as well as the slides. Sometimes, the old-fashioned way of doing things is really the best way, and no crashes to worry about! We encountered some things that we didn’t perceive happening at first while launching an epic online course. These weren’t monumental, but they are worth mentioning. No matter how much you plan, you can’t know how everything will appear in the final product, but at least with a storyboard you can prepare for most things, which makes unexpected occurrences less significant. These had to be shortened somewhat, so not too catastrophic! 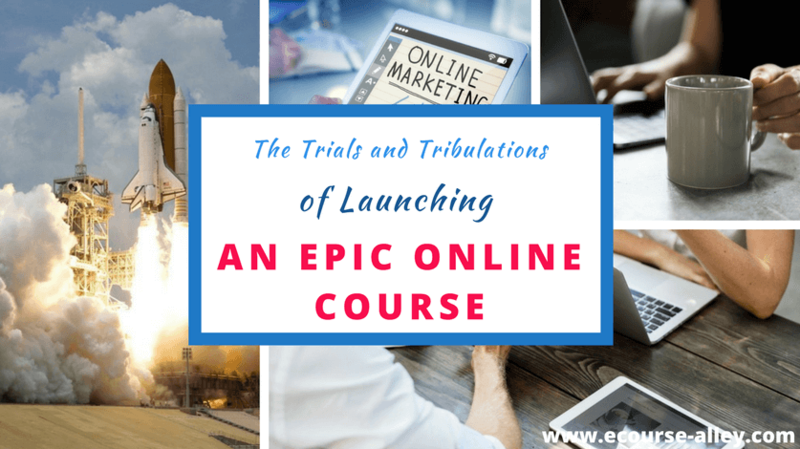 Ok, so we went over some struggles and unexpected occurrences that we experienced while launching an epic online course, but there were a lot of positives too! First of all, the sense of accomplishment when our epic 100+ slide storyboard was complete, edited and reviewed internally. Next, I would personally have to say that making the final course slides was fun! Also, recording the audio and video was exciting. Now, it can feel daunting at first, but once you get into it, it is very satisfying having your final product recorded and ready to go. The next milestone was when we finally uploaded the video lectures into our course platform. This gave us a great sense of accomplishment and contentment. On a more technical note, our decision to use PowerPoint to create our storyboard and course slides paid off as we just had to modify the Master Slide view and tweak our slides a bit. Then, in a matter of days, we went from our rough draft blueprint of our course to the final course slides! 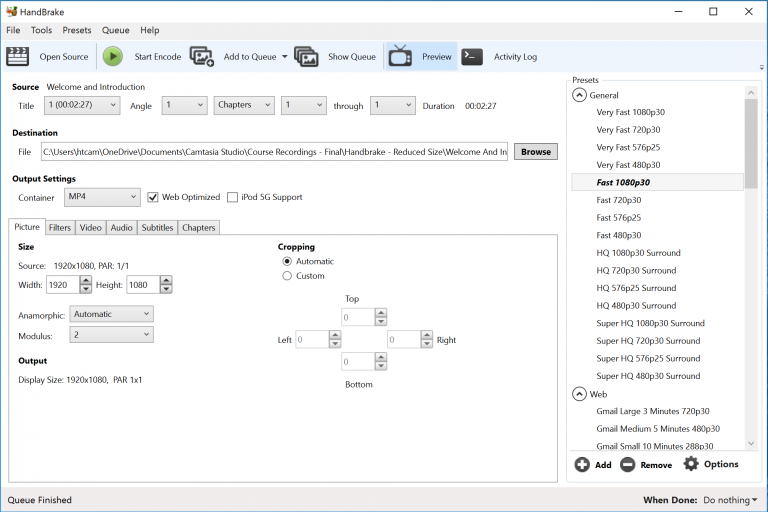 Furthermore, editing audio and video using Camtasia was not only easy, as their user interface is very user-friendly, it was very fast to edit the raw content as well! I’ll now talk briefly about what went into editing videos and course content during the process of launching an epic online course. Our process was to make sure the content was edited at the storyboard phase thoroughly first – this is why you do a storyboard in the first place! This was to help avoid having to do any content editing of actual video or audio files later on – which is MUCH more time-consuming! However, we knew there would still be some tweaks we would have to do to the videos in Camtasia after recording. 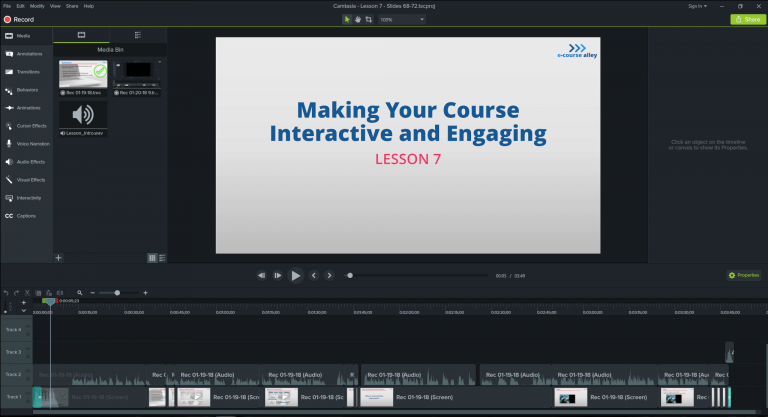 Camtasia was our go-to screen casting software and it integrates well with PowerPoint which was also another plus. So, what type of editing did we do after recording? Well, sometimes we messed up a section or there was too long a pause in our recording. Therefore, we clipped these parts out of our videos! All of our videos started and ended with our theme music and faded in and out. These features were all added in with Camtasia. Also, we needed to enhance some videos with overlaid text, and others we needed to add zoom in and out features in order to show some areas more clearly – this was all done using Camtasia on the original recording. So that was basically it for editing – cutting out minor mistakes and adding enhancements, such as text, fade, zoom effects and background music. So, as I’ve said many times before in my blog posts, Thinkific is our course platform of choice for a few different reasons. One is that it had a free plan to start and the interface was easy to use. Also, the staff are very helpful if you have any issues. I’ve summarized below how we went about uploading our video files to Thinkific but if you’d like a real-time behind-the-scenes look, check out our ECA YouTube Channel. These videos will also show you how to include assessment questions too. After the video was compressed, we opened our Thinkific course site, where our course curriculum is housed, and added a “Video” element. We then created a page title and dragged in our video. It uploaded in a few seconds. Then, they also recommend you use a thumbnail image for each video, so that a random place in your video isn’t chosen automatically for the main image. 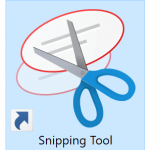 So, for this step, I used the built-in Snipping tool in Windows to take a screenshot of the first slide of the video (from PowerPoint). 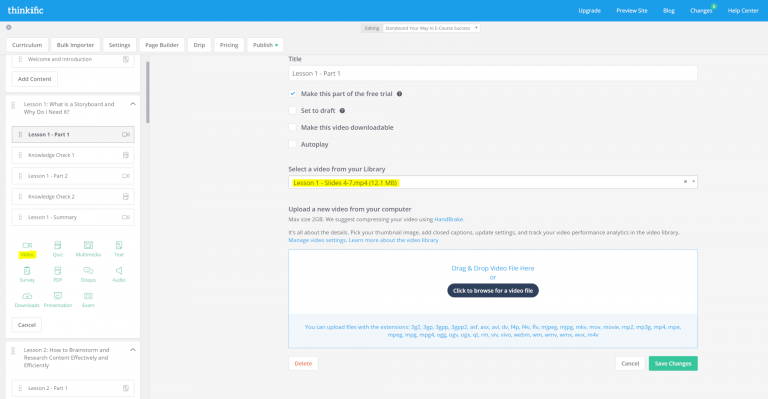 Then back in the Thinkific platform, I clicked on “Manage Video Settings” where I was able to upload the thumbnail image. The last step was to click “Save Changes” and then we were done uploading our video! Afterwards, we previewed the video as a student to make sure it worked properly. Marketing Madness! As I like to call it! How do you get the word out there about your masterpiece? How do you make some sales? I could do a whole post just on this topic, and maybe I will in the near future, but to stay focused on what we’re talking about today, I‘ll list what we did to try to get the word out while launching an epic online course. First of all, note that this blog post is coming out around the time when our online course had just launched recently, so it is still early on in our marketing strategy, besides our pre-launch marketing campaign. No launch is ever completely perfect, no matter how many courses you have already created or how much you plan. Launching an epic online course is even more complicated because it usually is longer and therefore takes longer to produce. I’ve created many many courses over the last decade or so using various different software platforms and I still learn something each time I produce new content for an online course. Maybe we could have always used the Downloads element on the screen after each video and indicated for them to click next to download the file each time. 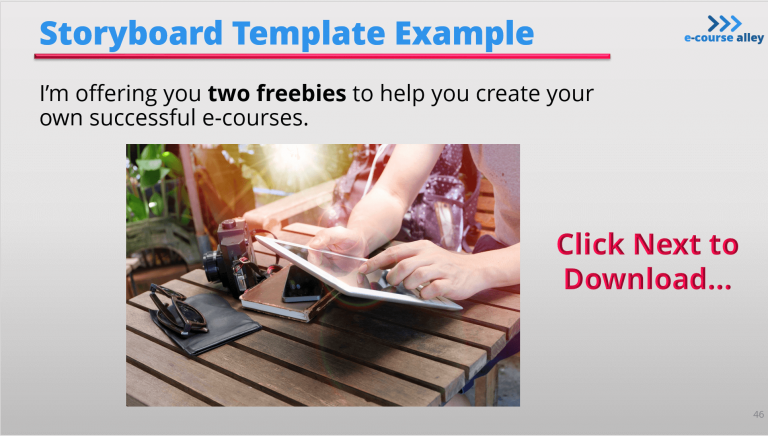 So, just in case this is the first blog post you’ve stumbled across at e-course alley, what is this storyboard course all about? Well, here is a short description and link (click on the image below) if you want to hop on over to the landing page which provides more details and also allows you to get a FREE TRIAL of the course which includes the introduction and first 2 lessons free of charge (for a limited time only!). So how can this course benefit your strategy for creating online courses and ultimately help you grow your online course business? 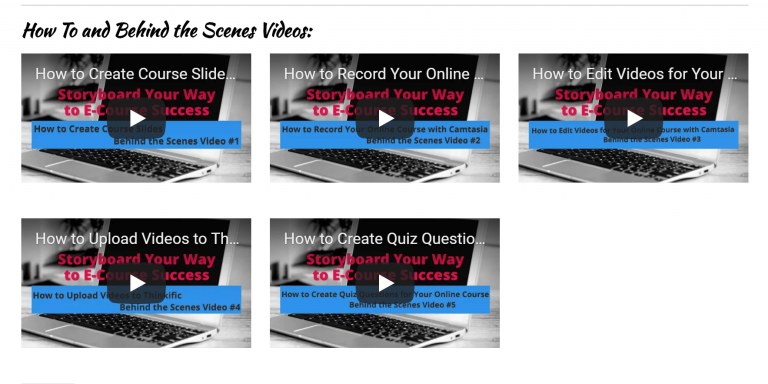 Well, Storyboard Your Way to E-Course Success goes in depth to show you why and how a storyboard or blueprint of your course content should be the first step any course creator should take before diving in and recording video lectures! This course will walk you through the reasoning for storyboard creation, to how to get started with brainstorming techniques, to what storyboard template to use, to creating media mock-ups and incorporating interactivity into your online course design, right down to how to end your course by building in course challenges and upsells (content upgrades) or cross-sells (related products). It really is a complete package of online course design techniques to create a course blueprint. If you are now even more intrigued after reading what you will receive and how it can transform your content creation process, just click below to learn more and to get the FREE TRIAL which we only plan to have available for a short time during this launch season. 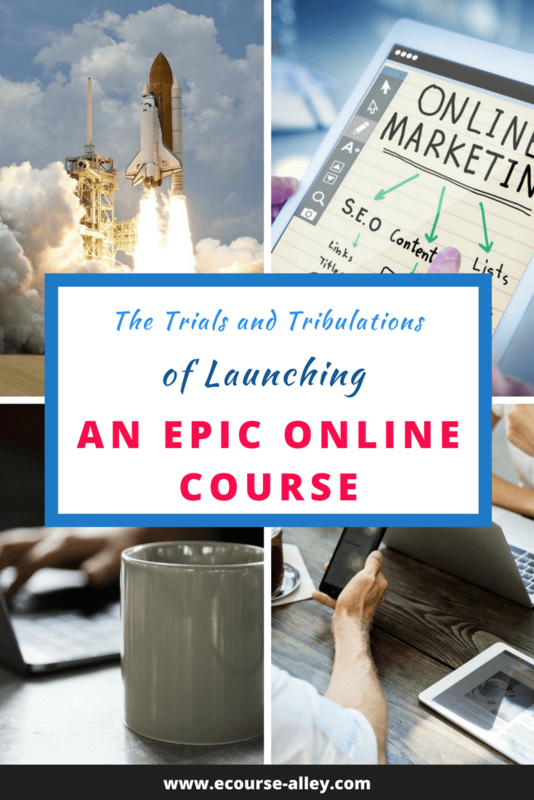 I hope this post has given you some insider information about how we went about launching an epic online course. 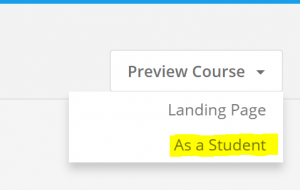 Maybe you are at that stage where you are launching an online course for the first time or maybe you are still contemplating building one or in the beginning stages of building your first one. Whatever it is, I hope this post and other blog posts on our website will give you some advice and help you succeed. 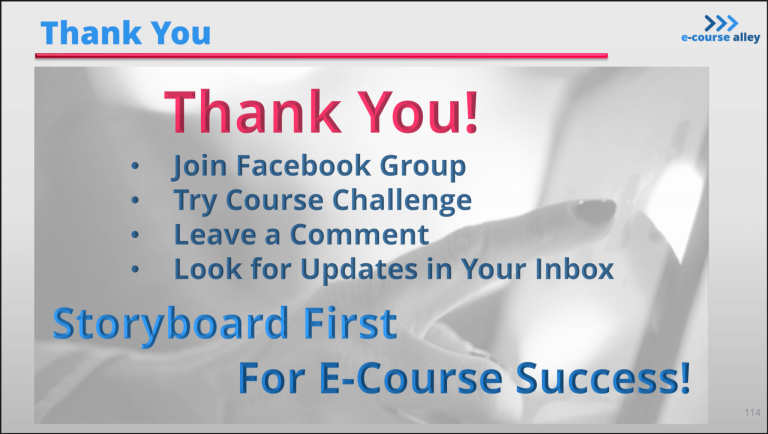 We always strive at e-course alley to tell you how it is – nothing held back– as we want to build a community of e-course creators around the world! Become Part of the ECA Community!